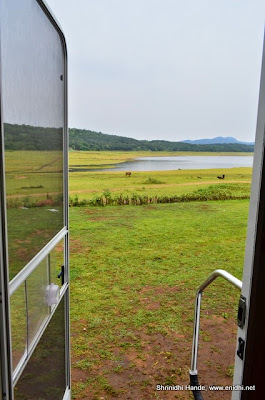 Home / Adventure / Asia / kannada and Karnataka / product or service reviews / Travel and Living / SaiVishram Camping Trailer holiday experience! Holidaying with caravans was on my wish list since long. Had seen them in Europe, where it is very common to see motor homes being pulled by cars heading in and out of town. People drive them to campsites, sleep, cook in them and come back. 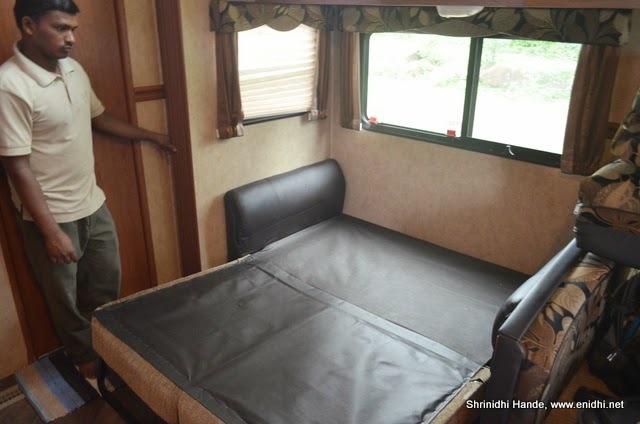 The idea of caravan or motor homes is non-existent in India. Hardly anyone owns any and they are not available for rent. 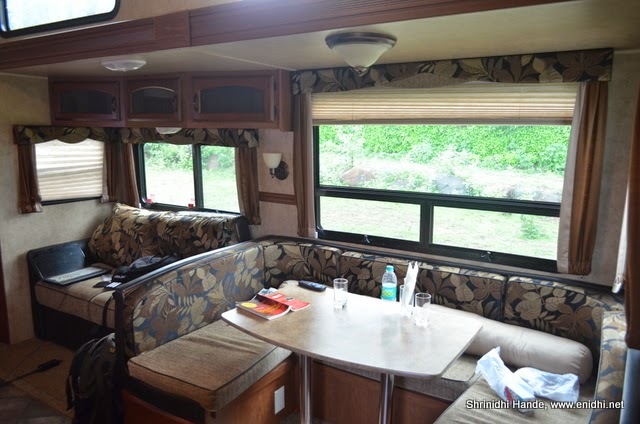 There was a caravan exhibition in Bengaluru in April, but I learnt from the organizers that they are only for sale. 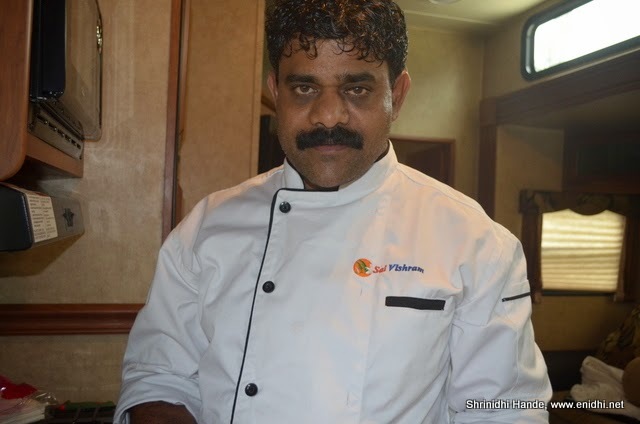 Caravans in India are used primarily my movie units and film stars to have some private zone near shooting site. 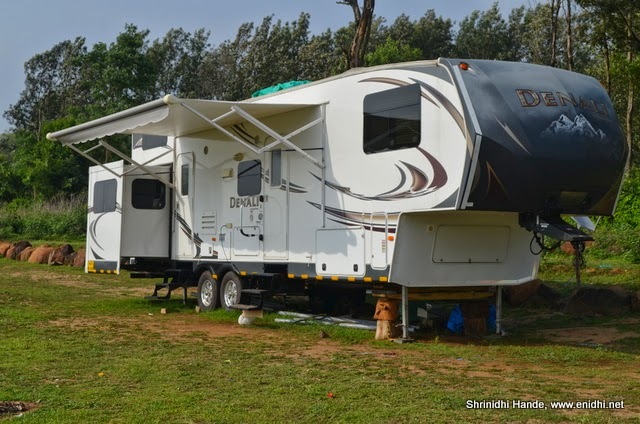 General public in India are not exposed to this idea of camping or caravan holidays. Swadesh movie had shown usage of Caravan but it didn’t really trigger commercial demand for caravans much. That said, recently I was invited by Sai Vishram to stay in one of their properties and share my experience. 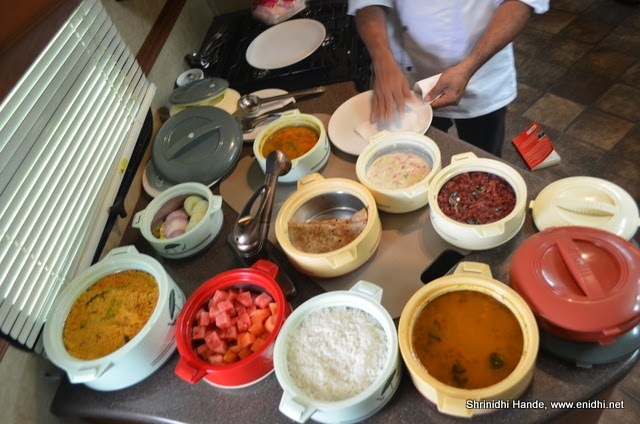 Out of couple of resorts in Coastal Karnataka and the mobile home parked near Coorg, the selection was very simple. I opted to try the mobile home. This post shares my experience staying in the same. After an overnight bus journey to Mysuru and another local bus to Kushal Nagar and a 13km taxi ride from there, we reached the motor home at about 10.30AM on Saturday. Indrani had gone there a week earlier, so from her post I had an idea what to expect. Seeing it in flesh was much more exciting than seeing it in pictures. We were briefed by Umesh about its utilities- the bedroom, toilets, bunker bed, bedroom etc. Apart from master bed room, there is a bunker bed for kids, a secondary living room and toilet. All in all, a family of 2 adults and 2 kids can stay comfortably inside. In the living room there is television with DTH, a fully functional refrigerator, a microwave oven and a wash basin, besides sitting arrangements. Dutchmen is a popular brand selling trailer homes and Denali is one of their very popular offerings. It is available in different configurations, one of which was purchased in US and brought to India by the promoters of Sai Vishram. It is imported as is without any customization and appears that Dutchmen doesn't have any after sales support in India- so the maintenance is done by local people. Mobile home, unfortunately doesn’t have a driving unit. So you can’t drive it as per your desire. It is pulled around by a truck, so moved only when really needed. 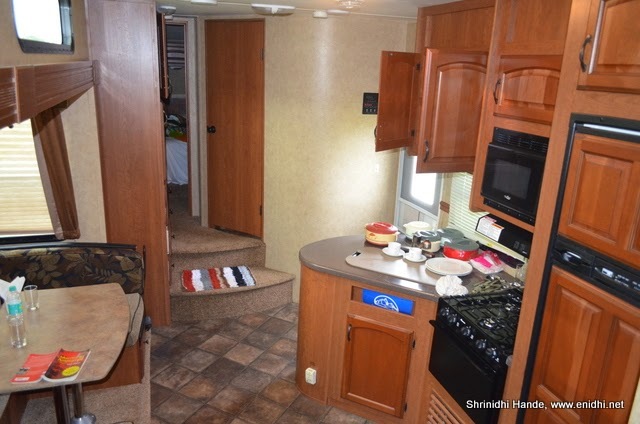 But on the positive side, because there is no engine and driver seats, this Mobile Home has more space. 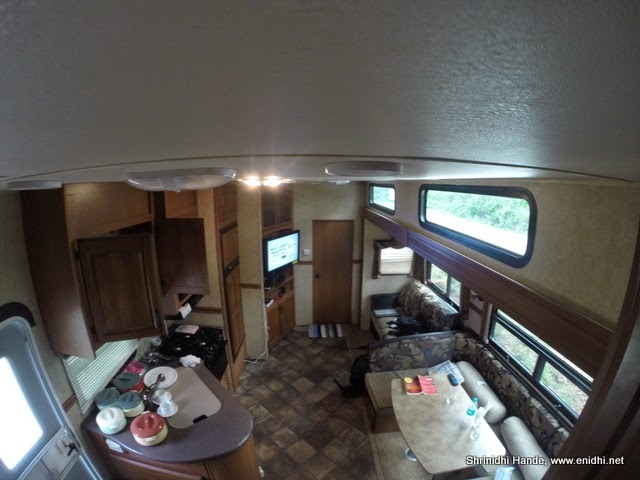 Denali motor home is a complete functional home with bed room, kitchen, toilet and other essentials. The unit has moving parts, using which space can be increased. Everything inside is made for US and not customized for India. 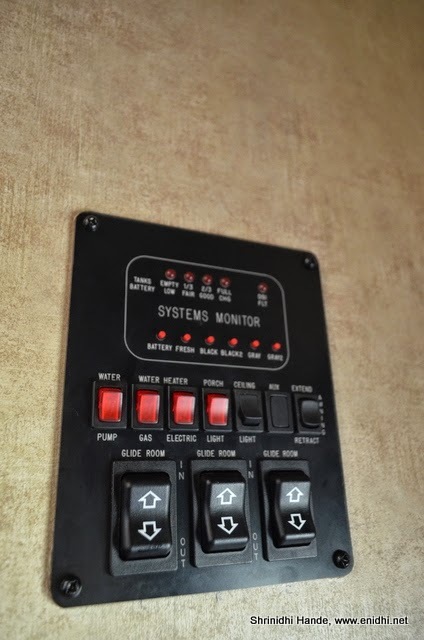 Power is 110V, switches behave opposite to what we are used to in India, power sockets are US style and so are the toilets. My laptop charger wouldn’t fit in easily and I had to do some jugaad, but after sometime the crew got an extension box, fixed it to caravan’s power supply from generator and now I had couple of power sockets available to me, India style and 220 V. I also asked for a bucket and a bug, as well as two plastic chairs, which Umesh promptly supplied. Window shades can be opened for more natural light, it can be tilted a bit to let fresh air in. There's a fine net on the windows to prevent insects or other things come in. We freshened up, relaxed for a while and it was lunch time. Naranana, who hails from Mangaluru and currently based in Sai Vishram’s Bengaluru properly was brought in to cook for us. He cooked multi-course pure vegetarian meal for us. It consisted multiple items and in large quantities, we could only consume a part of it. We requested him to reduce the quantity for subsequent meals. Some fruits were left in the refrigerator that we can much on when we felt like. I had plans to try some adventure with coorgskyadventures, but when I called I was told due to rains they have stopped the flying for this season. Their website's index also had ‘under maintenance’ message. I do not know if microlight crash and death accident that occurred one week ago had any influence on this. 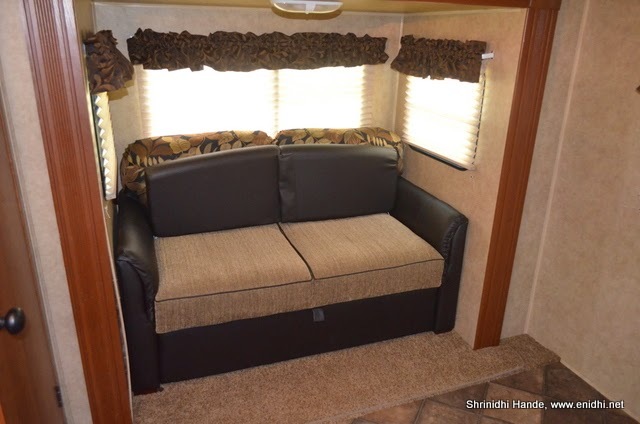 Denali motorhome has lots of drawers and utility spaces. Useful for those who stay long term but not needed for short term visitors. 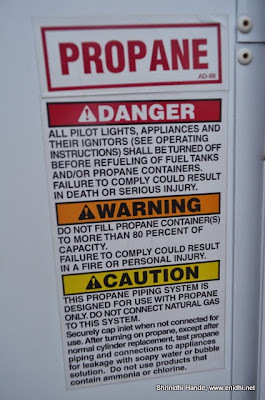 The kitchen unit runs on propane, but is not used-probably for lack of compatible gas supply (not sure if it can take LPG and the holder doesn’t fit regular domestic cylinder) or due to safety reasons. The arrangement of cooking outside and supplying works beautifully well, because you don’t want the cook to take all the space in the living room preparing food for you. The idea of letting customers cook their own food would have been probably more fun, but then the arrangement of utensils, ingredients and so on will add another dimension of complexity. Above: Gas cylinder holder is not suitable for 14 kg LPG cylinder and is designed for propane cylinders. Once we came back it was again dinner time. Another round of full meals later we went to bed. The Denali RV motorhome doesn’t have provision to supply hot water, though there were twin taps one for hot and another for cold (I guess because there's no gas unit installed, heating water is also not possible). Umesh got us hot water from the resort. In case customers prefer a more spacious/traditional bath facilities, they can walk to the resort and use one of the rooms there. 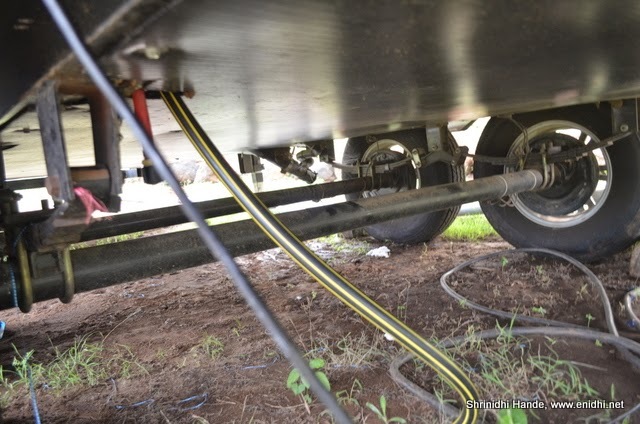 Above: Wheels of the RV- I find its leaf-spring suspension a bit delicate for Indian roads. Even Tata Ace comes with more sturdy suspension. 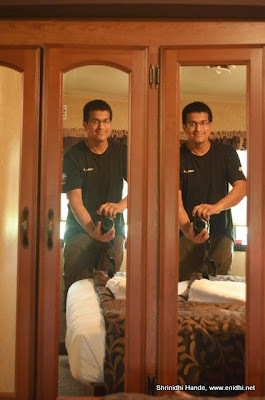 Day 2 my original plan was to take a taxi and go around to nearby places like Dubare, Golden temple etc, but eventually I decided to stay put in the RV. It was a cloudy day and very pleasant weather. I spent time reading books- Murder in Amaravathi and Elephant catchers. Usually my road trips involve lots of driving, site seeing and a quest to see the most in limited time. For a change, it was nice to be doing nothing and relaxing. There were couple of instances where total strangers knocked door out of curiosity and wanted to know what this thing is. Allowed them to take a quick look, without letting them in too much. Overall, it is a unique experience, not available elsewhere in India easily. 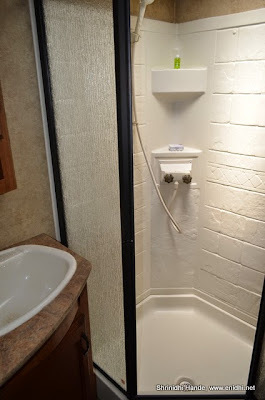 It is not the most spacious, luxurious resort experience, but for those who haven't had a holiday in a mobile home or camping trailer or caravan, this is the closest and most affordable experience to try. Another great part of the bargain is that staff of Sai Vishram are always on standby to help you, to provide whatever you ask for and make your stay more comfortable. - 1) Do not compare the space and facilities with that of a star resort. While resorts can offer space and facilities in abundance, motorhome is here to give you a different kind of holidaying experience. 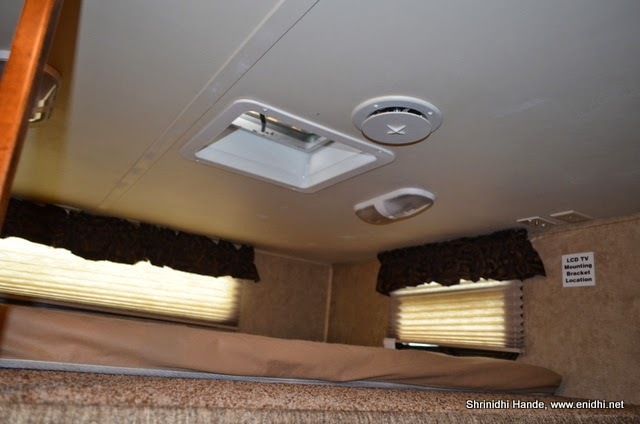 RVs have their limitations in terms of space and other things. So approach with a mind to enjoy a unique experience and NOT to find shortfalls and keep complaining. - 2)Unit’s air conditioning capabilities are a bit limited on a super hot day and not all areas give you same level of cooling. You can optimize cooling effect by closing doors, lowering window shades and other acts that help in faster cooling. 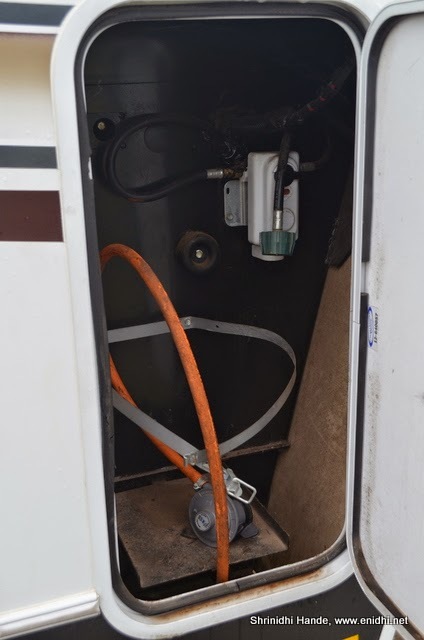 3)The RV is powered by a generator, as power supply is not very reliable in the area. Though the generator can run 24x7, it helps if it can get some short breaks to cool down a bit. When you’re going for a walk or something, tell the staff, so that they can switch off the genset. 4) Handle the unit with care. It is not designed to handle the kind of abuse Indian customers throw at it. Be gentle to the system, so that it lasts longer. if broken, some of the spare may not even be available in India. 5) Do carry some games or other stuff to have fun. 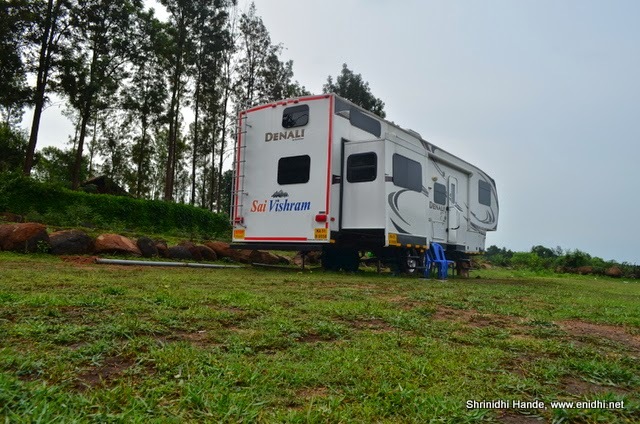 There's acres and acres of open space in front of you which you can make maximum use of. Dubare, Golden temple, Kaveri Nisargadhama are some of the attractions within 10-15kms range. 6) Keep doors closed in the evening to prevent flies and mosquites from coming in. Once they come it, it is very difficult to make them go out. Monday morning with heavy heart we vacated the motorhome. Thanks to Sai Vishram for hosting us, thanks to Santhosh, Umesh, Narayan and others for providing high quality service. Its a wonderful experience, but needs to be driven around than being static. Like the concept. An informative post. I'll also try it during my south trip. unique experience. Should try once. Very nice & creative concept brought in India. Seeing the weekend culture evolving super fastly in India, this kind of concept will soon find prospective audience (if not for purchase, but definitely to spend few days as part of travel package). Thanks for sharing with Readers.